This morning, the House Science Committee is holding an unusual hearing, at which the committee’s chairman, Rep. Lamar Smith (R-TX), apparently aims to justify subpoenas he already has issued to New York Attorney General Eric Schneiderman, Massachusetts Attorney General Maura Healey, and eight organizations and foundations concerned with the issue of whether Exxon deceived on the public on the issue of climate change. The subpoenas to the attorney generals of New York and Massachusetts are not grounded in any legitimate legislative purpose — and they violate the Constitution’s protections for states’ rights. At least five state attorneys general are investigating ExxonMobil, looking at claims that Exxon defrauded its shareholders and customers by supporting efforts to deny the risks of climate change from fossil fuels, when the company already had extensive research showing that the risks were real. These are clearly valid investigations; as Yale School Dean Robert Post has argued, the First Amendment does not protect fraudulent statements. Chairman Smith’s subpoenas violate state sovereignty by interfering with these attorney general investigations. The 10th Amendment says, “The powers not delegated to the United States by the Constitution…are reserved to the States respectively, or to the people.” The states have broad police powers to protect their residents. Chairman Smith has not cited any provision of the Constitution or other federal law that gives him the power to interfere in a state’s investigation of a corporation for fraud. Meanwhile, the U.S. Supreme Court has consistently required a congressional committee to have a “valid legislative purpose” in order to investigate a matter. Chairman Smith says the committee has a role in ensuring that the attorneys general are not pressuring the “private sector…to make research funding decisions based in part on a desire to avoid burdensome state investigations and political or ideological coercion.” He also claims the committee could legislate to seek to “correct” any “imbalance in scientific inquiry” resulting from the fraud investigations. State officials need the authority to enforce fraud and consumer-protection laws, without congressional committees acting to hinder such work. The subpoenas to the organizations and foundations are not grounded in any legitimate legislative purpose — and they threaten free speech. For a congressional committee to demand documents from advocacy and research organizations, as well as charitable foundations, simply because they have spoken out on an issue of concern, is a threat to free speech and our democracy. The subpoenas represent a dangerous new direction that threatens to suppress the speech not only of environmental groups, but also civil rights groups, reproductive choice groups, conservative advocacy groups, and others. New York University law Professor Burt Neuborne called Chairman Smith’s subpoenas “just another retaliatory gimmick aimed at making it too expensive and time consuming to criticize a powerful entity with deep pockets capable of enmeshing the critics in legal quicksand.” These subpoenas are the legislative equivalent of SLAPP suits filed by corporations with the aim of stifling and deterring public debate by critics. Two of the three witnesses that Chairman Smith has called for today’s hearing — Professor Ronald Rotunda and Elizabeth Price Foley — have extensive financial ties to the fossil fuel industry and to think tanks that deny the dangers of climate change. The fact that the Chairman is staking his argument about the validity of the subpoenas on the testimony of witnesses with such obvious bias suggests how improper this whole effort is. The purpose of this effort by Chairman Smith seems to be to try to intimidate critics of, and to score political points for, fossil fuel companies. 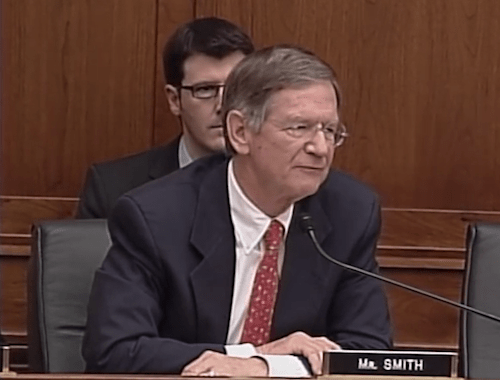 It’s worth noting that Chairman Smith and other members of the committee have taken extensive campaign contributions from the fossil fuel industry. We are in the final weeks of this Congress and there is so much important work that the House Science Committee could be doing instead. The American people expect Congress to address serious challenges our country faces. Instead, Chairman Smith wasting precious time, explaining the rationale for subpoenas that the Chairman already has sent. Worse, he is using his committee as a dangerous threat to our democratic system. I have served on the Committee on Science for more than two decades, and during that time this Committee has accomplished great things. We’ve overseen the completion of the International Space Station and the sequencing of the human genome, and we’ve undertaken serious investigations, ranging from the Space Shuttle Challenger accident to the environmental crimes at the Rocky Flats nuclear site. However, lately the Committee on Science has seemed more like a Committee on Harassment. The Committee’s prolific, aimless, and jurisdictionally questionable oversight activities have grown increasingly mean-spirited and meaningless. They frequently appear to be designed primarily to generate press releases. However, none of these recent investigations has rushed head long into a serious Constitutional crisis like we are about to face. We are moving into dangerous and uncharted territory. …the Democratic Members of the Committee also take this oath seriously. We will not sit idly by while the powers of the Committee are used to trample on the Bill of Rights of the U.S. Constitution. I implore you to cease your current actions before they do lasting institutional damage to the Committee on Science, Space, and Technology and the Congress as a whole. Despite all the effort put into today’s hearing by Chairman Smith, the session only underscored the unprecedented, disputed, and controversial nature of these subpoenas. The three law professor witnesses selected by Chairman Smith, plus the witness chosen by Ranking Member Johnson, law professor Charles Tiefer, sparred with committee members regarding the legality of the subpoenas. Eleven Democrats on the Committee attended the hearing, and all of them spoke out forcefully against the subpoenas. Some highlights are captured in my Twitter feed — perhaps the most powerful being Rep. Don Beyer’s (D-VA) playing of a video clip in which House Oversight Committee chairman Jason Chaffetz (R-UT) tells CNN’s Wolf Blitzer that his committee, which clearly has wider investigative authority than the House Science Committee, lacks jurisdiction to investigate the illegal $2500 campaign contribution from Donald Trump’s charitable foundation to Florida attorney general Pam Bondi and the subsequent decision by Bondi’s office not to investigate Trump University. “I don’t see the federal jurisdiction in this case, it does look to me to be a state issue, it’s regarding an attorney general in Florida,” Chaffetz told Blitzer. But another point that stood out came in testimony from Professor Jonathan Turley, the only of the three GOP-called witnesses who is not linked to fossil fuel money. While Turley, disagreeing with Professor Tiefer and others noted above, said that Chairman Smith had the legal right to subpoena the state attorneys general, he expressed serious concern about extending such subpoenas to the groups and foundations. I am most concerned about the congressional subpoenas targeting environmental groups like Greenpeace. Critics have charged that the state attorneys general investigation are part of a coordinated effort with some groups to target political opponents and to harass dissenting experts in the field. Yet, targeting public interest groups has an obvious chilling effect on free speech and association. As a prudential matter, Congress should avoid the investigation of public interest organizations in their advocacy efforts. Once again, however, I have been called upon to address the constitutional barriers, if any, to subjecting public interest organizations to congressional subpoenas. There is no such threshold protection that would attach to a public interest organization as opposed to any other organization. Indeed, few members would want such a bar when Congress routinely seeks information from the not-for-profit industry and advocacy groups on a variety of issues. Public interest organizations like Planned Parenthood and church-based groups receive federal and state funding. They also can be an active component in violating federal laws or in denying basic rights to citizens. Additionally, we have seen an explosion of different types of corporate structures created to shield political donations and carry out political agendas. Regardless of whether a target is a for-profit or a not-for-profit corporation, there is no threshold constitutional barrier to compelled testimony or production of information. There may be heightened first speech or associational interests involved in such demands, but those are highly case-specific (and evidence-specific) controversies…. The ubiquitous character of not-for-profit corporations makes any threshold barrier impracticable. There is a plethora of such groups set up by advocates from industry, academics, and public interest areas. Some could easily be viewed as part of a conspiracy or underlying effort to violate federal laws, as was the case with certain tobacco industry groups. Indeed, tobacco groups were subject to subpoenas to uncover the identities and activities of their sponsors and contributors…. In this sense, the actions of these groups and prosecutors raise the same costs in investigating climate change critics. Because many of these groups also have political interests, an alliance with some attorneys general raises equally serious concerns over (to use a paraphrase of Clausewitz) the use of prosecution as politics by another means. Yet, such demands come at a high cost for the political system. The scope of the demand on public interest groups could raise specific concerns over the chilling effect on free speech and association. To be sure, there are cases where allegations necessitate the demand for communications made by not-for-profit corporations. It is for that reason that I would encourage both the attorneys general and Congress to minimize the investigation of academics and public interest groups in this controversy. In his oral testimony before the committee, Turley repeated his disapproval of government authorities investigating legitimate disputes about scientific issues, and seemed to suggest that both sides in the climate change debate had crossed that line. In reality, the attorney generals’ probe is not an effort to criminalize debate about science, but rather an effort to determine if a public corporation, ExxonMobil, committed fraud. But the concession by Turley, the only witness for the GOP not compromised by fossil fuel money, that the subpoenas to the groups are “problematic,” underscores the shaky foundation on which Chairman Smith’s subpoenas rest.